In times past, the pantry was the heart of the kitchen. 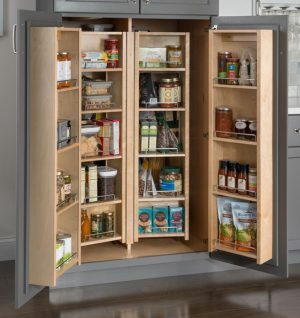 Today pantries are again a necessity in most kitchens and pantry organizers help keep the pantry in order. Pantry Organizers come in several styles to better utilize pantry space. They make locating food items, cookware, and kitchen staples easier creating a more efficient kitchen. An orderly kitchen also saves times when preparing meals. Van Dyke’s Restorers is now offering Elements and Restores brand organizers. Recently, I showcased the vast selection of Lazy Susans, Pull-Out Trash Bins, and Closet organizers. In this blog, I want to introduce you to the pantry and cabinet organizers in the collection. The Premium Chrome Swingout is new to the selection and is used on a standup pantry with hinged doors. It features chrome baskets that swing out on self-closing slides. The adjustable baskets pivot 90 degrees for easy access to food items and have a 175-lb. weight capacity. The Wood Swingout and Wood Door M ount units feature bookcase-like shelves made of solid birch and birch plywood. 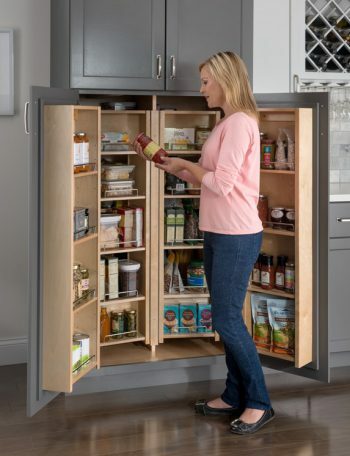 Piano hinges on the swingout unit allows left and right shelves to swing out of the pantry. The door mount unit mounts to the inside of hinged pantry doors (minimum 46 1/2” tall). The door mount units can be used as stand alone or with the swingout unit. 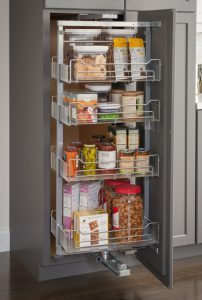 Premium Chrome Pullouts and Wood Pullouts are two more options for organizing the pantry. As the name implies, the units slides out from the pantry allowing easy access to the contents. 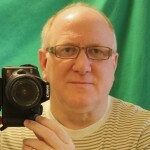 The chrome unit operates using soft-close slides with 220-lb. load capacity and has heavy-duty wire baskets with chrome finish. The frames on the shelves are adjustable to various heights. The wood unit utilizes a 400-lb. capacity ball bearing bottom slide with 225-lb. ball bearing top slide. The top shelf and bottom two shelves are fixed with two adjustable middle shelves. The unit is mounted using the included patent pending, 6-way adjustable door brackets. Base and wall solutions are great for organizing cabinets similar to the pantry solutions. 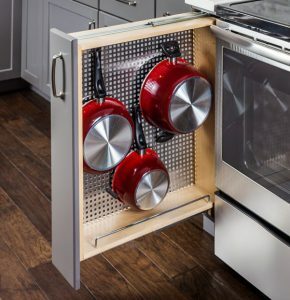 This collection includes the Tray Divider Pullout for baking pans, the Peg Board Filler Pullout for pots and pans, and several styles and sizes of pullouts for upper and lower cabinets. Rollout Drawers are a simple soluti on for existing cabinets or new construction and operate with easy-to-install slides using four screws. These wooden box-style drawers come in an array of sizes to suit any cabinet size. If you can never find a serving spoon or your silverware drawer is topsy-turvy, try one of the Drawer Organizers including the Wood Cutlery Insert and Double Cutlery Drawer. The collection also includes a Pot/Pan Organizer with adjustable wire dividers, Peg Board Inserts for dishes and cookware, Spice Tray Insert, and Tipout Trays for keeping sponges and other items handy under the sink. Complete your kitchen makeover with a Wire Tray Divider, Door Mounted Spice Rack, Stemware Rack, and Wine Bottle Rack. 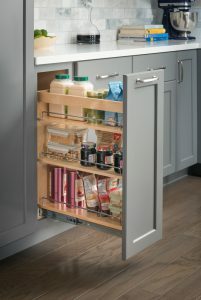 Check out the complete selection of cabinet, pantry and closet organizers at vandykes.com.